Where we've been, where we're planning to go, and where we hope to go. Stuff will appear here. 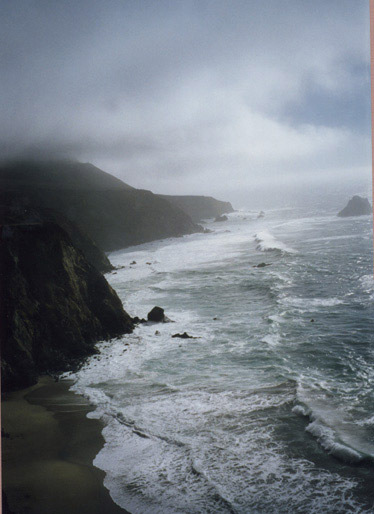 We drove on down, stopping off with dear friends in the Carmel Valley, and heading South into the wilds of Big Sur to visit the woods, trails, campgrounds and visitor fascinations along windy Highway 1, where the mountains meet the sea. The photo to the left is a shot I took in 1994, driving down for the first time with Loren Washburn for lunch at Nepenthe. After a day exploring Pacific Grove and Carmel, where Lise had never been before, we meandered down the coast the next morning and set up camp for a few days at one of the many parks in the region, having cleverly reserved ourselves a spot. The day before we left, there came a call from the instigator of an 'art erratica cookbook' art swap, mentioning they were along our intended route, and would we like to get together? And thus we had a delightful lunch with Scott and Yolie and a dear friend staying with them, and their daughter & her best friend... we camped and saw fireworks on the tiny beach at Morro Strand, took a day in Buellton and Solvang, and puttered back north via barbeque in Santa Maria (they're famous for it, who knew?) and thence HomeDownstairs to Kurt and Marina's in SC, English Tea and Dancing in the garden that Sunday and HomeSF(Upstairs) to our own wee bed again. I love road trips. Playing fiddle for Redtail Morris, nostalgia and delight for this fine hobby. New Orleans, by way of NYC and Maryland.